CGFNS International President & CEO Dr. Franklin Shaffer Speaks at Italian Transcultural Nursing Society - CGFNS International, Inc.
Rome—CGFNS International, Inc., President and CEO Dr. Franklin A. Shaffer, EdD, RN, FAAN, FFNMRCSI, was a featured speaker at the 11th National Congress of the Italian Transcultural Nursing Society in Rome, Italy, where he discussed nurse migration in the context of the United Nations’ Sustainable Development Goals. “We are the heartbeat of the world’s health system, but our training must be flawless if we want to find space in a work context,” Dr. Shaffer said. “Today, the demand for nurses is higher than ever, and in addition to local nurses, migrants contribute to the health and well-being of host communities. If we were to trace the global composition of the nursing workforce in Italy, 6 percent of nurses have received a foreign education. CGFNS brings together over 3 million health professionals from 227 countries and supports the global community with programs and services that promote practical skills and knowledge for health professionals. 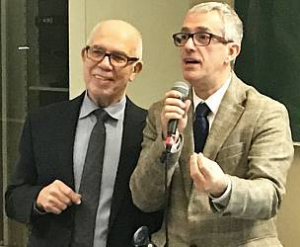 CGFNS Trustee and Transcultural Nursing Association President Alessandro Stievano also gave a presentation during the program regarding trans-cultural nursing and the United Nations’ Sustainable Development Goals for Health. “The importance of having a unique curriculum of studies, even if only containing minimal differences, can be ‘spent’ around the world and should not be underestimated, especially for health professions giving the greatest mobility to students and researchers,” Dr. Stievano said.